I rank that right up there with "Expect more, pay less" (as applied to TMs). LMAO!!!! I love it! I guess I know a good way to lighten the mood next time I am zoning notions! Just because something is legal, doesn't make it any less icky. 0853....I'll have to search for that tomorrow! What was that line on "True Blood" ---- "My Daddy / Uncle aint home now"
I checked for this at my store today...discontinued, and out of stock. I was going to grab one and show other TMs. <<writing down the DPCI>> gonna check our store, too. Probably same answer as MisterLogistics. If I recall you CAN infact marry your cousin but it would need to be at least your 4th cousin. 1st-3rd is too close and could cause some "issues"
I found the frame & that is not the picture that should not be there. At my store, the picture is 2 young kids. The dpci is 074-15-4190. The dpci of talan's picture is 074-15-0853. At my store, the picture is 3 young kids. The dpci is 074-15-4190. I didn't check for the DPCI of Talan's photo but that frame did have a photo of kids. It's in aisle C-6 in housewares at my store. The DPCI of the cousin frame was 074-15-0853.
and could cause some "issues"
Heck, that's corporate material right there. Where I live, they should have one that says "Sister Wives", though the part of the state with the FLDS community lives is up near the Utah border. 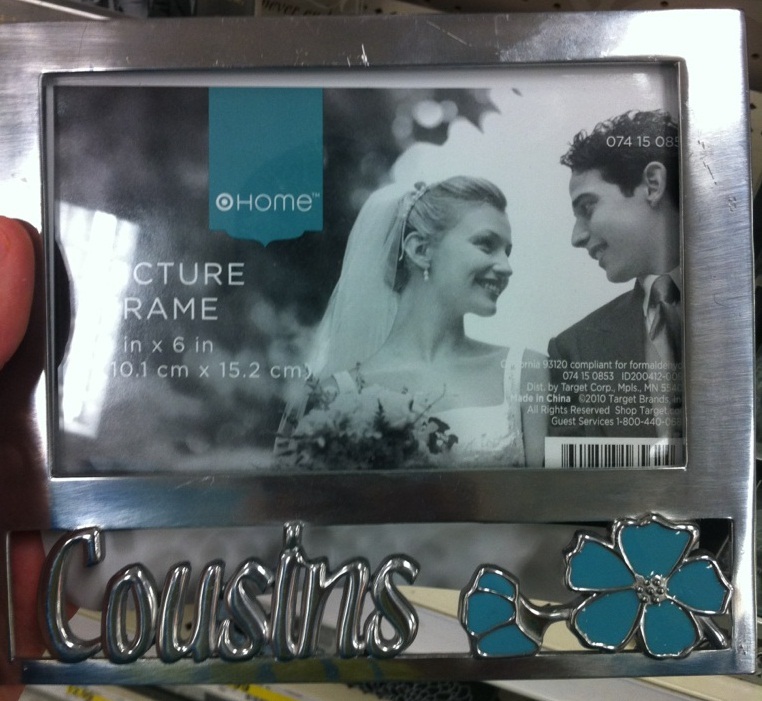 In some states, they could use that picture for a frame that says "siblings"....allegedly. I shared this with a bunch of my target contacts...they just laughed.